President-elect Donald Trump made a lot of promises before the election. Some of them changed throughout his campaign, but he remained steadfast on others. With a Republican majority in Congress and the potential for conservative additions to the Supreme Court, Trump should be able to follow through on some of the commitments he made. But Republican leaders in Congress don't agree with him on everything and there are some things he isn't legally able to do. Here's a look at some of the promises he made and what could be done. Trump has already dialed back his talk about the wall he's pushed for along the U.S.-Mexico border. In an interview with "60 Minutes," aired on Nov. 12, he said he would accept that "certain areas" would be covered by fencing. "But certain areas, a wall is more appropriate," he added. 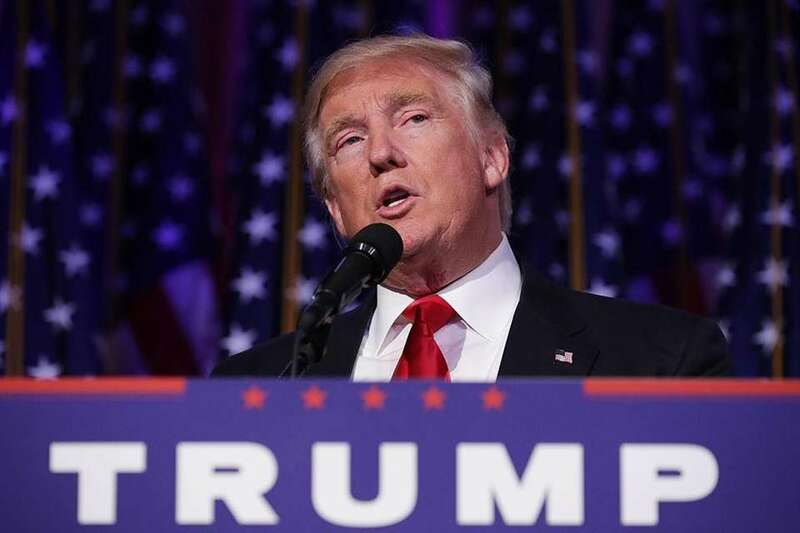 Building a full brick-and-mortar wall will take time and money, David Birdsell, dean of the School of Public International Affairs at Baruch College, said, and if Trump follows through on his plan to cut taxes, it will be difficult to find the money necessary. "There's no mechanism to make Mexico pay for it," Birdsell added. Trump may be able to allocate money for the wall through an executive order, but, more likely, he will need to agree on something with Congress. Republican leaders are more on board with a less-costly fence than a wall. Trump said in the same "60 Minutes" interview that there were 2 to 3 million undocumented immigrants with criminal backgrounds that he would deport. The distinction of people with criminal backgrounds was not always made on the campaign trail, and, according to the Migration Policy Institute, the number of immigrants with criminal histories is much lower, estimated at 820,000 in a 2015 report. As with building a wall, deporting millions of people would cost money that Congress isn't likely to approve. Additionally, undocumented immigrants are entitled to hearings before they are deported, according to William Stock, president of the American Immigration Lawyers Association. One thing Trump can easily do is rescind DACA (Deferred Action for Childhood Arrivals), one of President Barack Obama's executive actions that allows undocumented immigrants who came to the country as children to work without the fear of being deported. "That tool created to help people could be used against them," Birdsell said, since the information they provided to be part of the program makes them easier to locate. Trump and the Republican Party leaders in Congress agree on "repealing and replacing Obamacare," but they won't be able to repeal it in full, experts say. "They have to have something in its place before they undo it," Birdsell said, adding that the logistics make it a tough task. They would also need 60 votes in the Senate, and that would be tough if the proposal is to completely repeal the act. Kenneth Sherrill, political science professor at Hunter College, said there will likely be changes to the law, but they will take time. Birdsell and Sherrill agree changes to the act could be seen in the first 100 days of Trump's presidency, as he has promised, but it would be difficult to do that quickly. After his victory, Trump said he would consider keeping parts of the Affordable Care Act, including allowing parents to keep adult children up to age 26 on insurance policies and barring insurers from denying coverage to people with preexisting conditions. Trump has vowed to make deep tax cuts, while also promising to protect health and retirement programs that account for more than a third of the federal government's spending. He has also proposed increasing spending on the military and infrastructure. That combination would increase the national debt, according to the nonpartisan Center for a Responsible Budget. But Trump will likely get help from Republicans in Congress, who have been laying the groundwork for a tax-code overhaul that would lower rates and close loopholes. They could, however, still receive resistance from homeowners, businesses and other interest groups that benefit from current tax breaks. Many of the climate change laws, such as the regulations on the coal industry, that Obama put in place were executive actions. Trump can rescind those "with a stroke of the pen," Birdsell said. He also has power to undo other aspects of Obama's climate change legacy. The Paris Agreement was never voted on by Congress, and Trump could simply withdraw from it, Sherrill said. Additionally, if Congress passes the Keystone XL Pipeline bill again, Trump, unlike Obama, is expected to sign it. While, there would be pushback on these issues from environmentalists, that would not bother Trump, Sherrill added. Trump would be able to pull the United States out of the Iran Nuclear Deal that Obama negotiated with world leaders in July 2015, Birdsell said. But he would need cooperation from other countries to negotiate a new deal. "He can't put anything in its place unilaterally," Birdsell said. The European Union reiterated its commitment to the deal following Trump's victory, and Iran Foreign Minister Mohammad Javad Zarif said he does not expect to renegotiate the deal. "We had a long nuclear negotiation between Iran and the United States. I do not expect another negotiation, certainly not on the nuclear issue, but nor on any other subjects," he said. This is something Trump definitely can't do. "That violates the First Amendment," Sherrill said. He could potentially ban people from certain countries though. Trump would likely need an act from Congress to give him that authority, but there may be exceptions, Sherrill said. Trump has changed his position on the ban since the original announcement. He said instead of a ban, there will be "extreme vetting" of people entering from certain countries. It's not immediately clear what that would entail or what countries he was speaking about, but that will likely impact how many refugees the United States accepts. Kansas Secretary of State Kris Kobach, who helped write tough immigration laws in Arizona and is reportedly a key member of Trump's transition team, told Reuters that Trump could try to reinstate a national registry of immigrants and visitors who enter on visas from countries where extremist organizations are active. Under the program, known as the National Security Entry-Exit Registration System, people from countries deemed "higher risk" were required to undergo interrogations and fingerprinting on entering the United States. NSEERS was abandoned in 2011 after it was deemed redundant by the Department of Homeland Security and criticized by civil rights groups.